Make a sleep mask with soft minky and matching pajama pants In this 3 day course students will select their projects with the guidance of the instructors. A registration form is required for this class. Please mail, email or drop a registration form as soon as possible. Learn how to use bias tape to make fashion Gym Shorts! In this 3 day course students will select their projects with the guidance of the instructors. A registration form is required for this class. Please mail, email or drop a registration form as soon as possible. Advanced class, must have taken a beginner camp at Five Eighth Seams before. Create a Quilt with your choice of fabric. This is a great class to master straight lines and make a fun Quilt! This class is designed to make a woven fabric dress In this 4 day course students will select their projects with the guidance of the instructors. A registration form is required for this class. Please mail, email or drop a registration form as soon as possible. 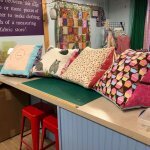 Learn how to make a reading pillow! Make a reversible super hero cape in the 6 hour camp over 2 days. Perfect for kids that love to sew and cook! Pick a knit dress or top pattern and learn the basics of sewing with knit fabric. *** All levels welcome. 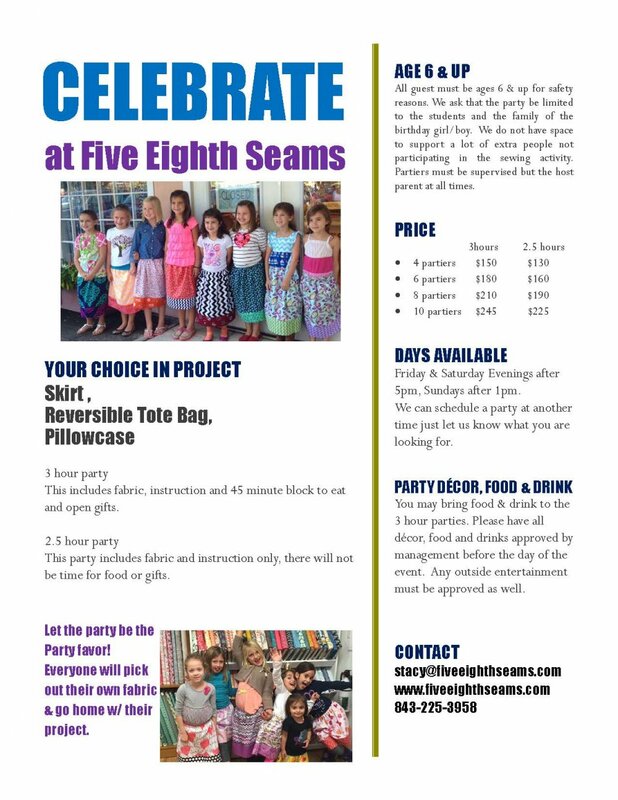 If you have questions about this please contact us at sewhappy@fiveeighthseams.com or 8432253958. ***** In this 4 day course students will select their projects with the guidance of the instructors.